The loss of glycosylphosphatidylinositol- (GPI) linked proteins from red cells and platelets results in severe clinical manifestations for patients with paroxysmal nocturnal hemoglobinuria (PNH) with poor quality of life, organ damage, and ultimately reduced survival. The cause is a somatic mutation in the PIG-A gene that normally codes for a protein, which is critical in the catalysis of the first step of GPI biosynthesis. Two proteins which are absent in PNH due to this mutation are CD55 and CD59. CD59 functions to prevent terminal complement components from forming the membrane attack complex. In PNH, the loss results in intravascular hemolysis and platelet activation, which in turn lead to nitric oxide (NO) consumption and thrombosis. In this article, the consequences of NO consumption and the subsequent organ damage are described. Diagnosis of acute leukemia is a complex process that includes examination of peripheral blood (PB) counts and smear evaluation, bone marrow aspirate (BMA) smear, bone marrow (BM) particle clot section, BM trephine (BMT) biopsy, and imprint morphology, together with the results of other relevant investigations such as cytochemistry, immunophenotypic analysis, and molecular-cytogenetic examination of PB or BM material. These processes that require the interaction of many medical care givers at different locations with different backgrounds require harmonization to bring to the treating physicians the accurate diagnosis and help the management team in risk stratification. The differences in methods for the preparation, processing, and reporting of BMAs and BMT biopsy specimens can vary considerably, and this may result in inconsistencies in disease diagnosis or classification. The final interpretation requires the integration of all these tests in the context of clinical and other diagnostic findings. These guidelines will help in standardization and improve the diagnosis of acute leukemia. It will involve every step in the diagnosis from sample collection to final reporting and classification. Sickle cell anemia (SCA) is an inherited hemolytic anemia with a wide spectrum of symptoms and complications, including variable bone pathologies ranging from painful crises to osteonecrosis. The aim of the present work was to assess the bone mineral density and some related biochemical parameters in adult patients with SCA. A total of 30 adult patients in the steady state of SCA were compared with 20 apparently healthy control subjects of both sexes. For each group, the following parameters were assessed: calcium, phosphorus, magnesium, parathyroid hormone, osteocalcin (OC), bone alkaline phosphatase (BAP), and bone resorption markers such as C-terminal telopeptide of type 1 collagen (CTX), N-terminal telopeptide of type 1 collagen (NTX), pyridinoline (PYD) and deoxypyridinoline (DPD). The bone mineral density (BMD) and T-scores were determined for both groups. The results showed that there were significantly lower calcium and higher phosphorus levels in the patients compared to the controls, while the serum magnesium showed no significant change. There was highly significant decrease in the serum parathyroid hormone in patients as compared to the control group. There was significant increase in serum levels of OC and BAP, whereas no significant changes were noticed in serum levels of NTX, CTX, PYD, and DPD. There was a highly significant decrease in the BMD and T-scores. The picture altogether denotes that SCA can cause serious bone changes that reflect on the morbidity and quality of life of the patients. We reviewed all samples submitted for screening of paroxysmal nocturnal hemoglobinuria (PNH) clones during the previous three years at the Flow Cytometry Unit - Hematology Section, Department of Pathology and Laboratory Medicine, King Faisal Specialist Hospital and Research Centre (General Organization) that were analyzed for PNH abnormal clones, and reviewed their indications for screening. 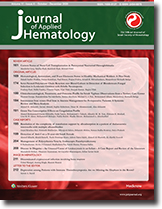 A total of 184 samples, mainly of peripheral blood from 169 patients (178 peripheral blood and 6 bone marrow samples), were screened with a yield of 10 positive patients(5.9%), the majority of whom were diagnosed as having aplastic anaemia and were referred for bone marrow transplantation. Although PNH is a rare disease, it has always aroused interest in the medical profession. In its early days this was because of its dramatic symptoms. More recently, it is hoped that growing understanding of the molecular defects in PNH and development of new effective therapies will reduce the symptoms and complications of the disease, rendering screening and proper diagnoses by flow cytometry technology a priority. Background/Objective: Recent attention has focused on certain thrombophilic defects that may predispose to pregnancy complications, including recurrent early fetal loss (RFL). This study aims at recording the prevalence of thrombophilia in Saudi women with normal pregnancy and in patients with RFL, in a community where thrombembolic disease is assumed to be rare. In this study, thrombophilic defects are defined by deficiencies in protein S, protein C, and antithrombin (AT), in addition to resistance to activated protein C (APCR). Materai and Methods: A total of 925 patients with RFL [3 or more lost first trimester (12 weeks) pregnancies] were studied 2 months after the loss of their last pregnancy. Women with normal trouble-free pregnancy (n=663) were recruited from the Antenatal Clinic, King Khalid University Hospital, Riyadh, as follows: first trimester (n=132), second trimester (n=293), and third trimester (n=238). Natural coagulation inhibitors and APCR were measured by ELISA-based commercial kits. Results: The prevalence of deficiencies of thrombophilic markers in RFL versus normal pregnancy was as follows: protein S, 7.9% vs. 5.1% (p < 0.036); protein C, 2.4% vs. 0.8 % (P <0.02); AT, 1.6% vs. 0.55% (P <0.053); APCR, 16.9% vs. 5.6% (P <0.036). Conclusion: The result of the present study led us to conclude that in Saudi patients suffering from recurrent pregnancy losses, like many other ethnic groups, thrombophilia, especially APCR, is a major etiological factor, and this makes screening for markers of thrombophilia in RFL all worthwhile. Background: We previously examined the potential of conventional Fourier transform infrared spectroscopy (FTIR) in an attempt to detect specific biomarkers for discrimination between disease free and acute lymphoblastic leukemia (ALL) bone marrow samples. In this case report study, we aimed to continue to follow-up, predict early relapse, and distinguish newly diagnosed ALL from disease free in remission (control) bone marrow samples. Patient And Methods : Four bone marrow samples were obtaind from an 11-year-old boy. Samples (1) and (2) for the patient in remission as diagnosed clinically and laboratory examination free, sample (3) diagnosed relapse in CNS, while sample (4) was taken post-chemotherapy induction. Results: The results revealed that characteristic band alterations arising from cellular protein, lipid, and DNA were identified in both control and diseased samples (relapse of ALL). There were specific changes that affected the secondary structure of proteins and appeared in the FTIR spectra confirmed with the second-derivative analysis. The overall protein structure in the control sample consisted primarily of a-helices, whereas in relapse ALL sample, it had a relatively high proportion of anti-parallel b-sheet protein constituents presumably due to leukemia. Different absorbance ratios for specific bands were calculated and plotted versus the patient's samples in different time intervals. There are significant fluctuations in the ratios under investigation, which can be attributed to the changes in the biomolecular structure between the control and relapsed samples. Conclusion: These ratios are all yield statistically significant differences in parameters that it can be used as an early predictor of minimal residual disease (MRD) in acute lymphoblastic leukemia. The decision to harvest peripheral blood stem cells (PBSCs) is frequently based on the enumeration of CD34+ cells by flow cytometry by using either single- or dual-platform methods. The aim of this study at the Department of Pathology and Laboratory Medicine of King Faisal Specialist Hospital and Research Centre (General Organization) was to evaluate an alternative method for circulating hemopoietic stem cell quantification, namely by means of the hemopoietic progenitor cell (HPC) parameter generated by the Sysmex XE-2100 automated hematology analyzer available in the Hematology Section. Two hundred and ninety two (292) samples of peripheral and cord blood were analyzed using single-platform flow cytometry and the immature myeloid information (IMI) parameter of the Sysmex XE-2100 hematology analyzer in parallel runs. The objective of this study was to minimize the number of CD34 determinations routinely performed by flow cytometry. A strong correlation was found between HPC and CD34+ in peripheral blood [r2 (0.692), P value <0.0001] and cord blood [r2 (0.555), P value <0.0001]. Therefore, with HPC levels below the detection limit of 00/mm3 or count of >30/mm3, it is reasonable not to await the CD34+ results before harvesting. These two situations account for more than 66% of the CD34+ determinations carried out by flow cytometry in our laboratory. Encephalopathy is a well-known adverse effect of ifosfamide caused by the accumulation of chloroacetaldehyde, a neurotoxic metabolite. It commonly develops within 2 hours to 6 days in about 2– 30% of patients who are exposed to ifosfamide and usually fades away in a few hours to few days after the discontinuation of ifosfamide in some cases. However, it may progress to severe, progressive encephalopathy that ends with death. Accumulation of chloroacetaldehyde to high levels interferes with the functions of flavoproteins in the mitochondria and leads to the observed central nervous system (CNS) disturbances. Methylene blue has been successfully administered for the reversal of this unfavorable event. We report the case of a 19-year-old woman, with relapsed Hodgkin's lymphoma, who developed ifosfamide-induced encephalopathy 16 days after the first exposure to rituximab, ifosfamide, carboplatin, and etoposide (R-ICE) protocol as second-line chemotherapy. R-ICE consisted of rituximab 375 mg/m2 and ifosfamide 5000 mg/ m2 along with mesna 5000 mg/m2, carbopaltin AUC 5, and etoposide 100 mg/ m2 and was given every 21 days. The patient presented with drowsiness, agitation, altered sensorium, and tonic clonic convulsions [National Cancer Institute Common Toxicity Criteria (NCI-CTC) stage IV]. Her laboratory investigations, including blood and cerebrospinal fluid (CSF) chemistry, septic screen, magnetic resonance imaging (MRI) of the brain were normal, and electroencephalogram (EEG) showed diffuse slow wave, which was indicative of metabolic encephalopathy. Ifosfamide-induced encephalopathy was suspected, and the patient was given methylene blue 50 mg intravenously every 6 hours for 3 days, with dramatic response within 6 hours and complete recovery in 24 hours after the first dose of methylene blue. To the best of our knowledge, this is the first case of ifosfamide-induced encephalopathy presented 16 days after ifosfamide exposure.